With the amount of attention Manuka honey is getting around the world today, especially all the claims that it is antibacterial, very healthy and an all-around “super food,” it is no surprise that there are a number of books hitting the market all about this product and these topics. One of these books is “The Honey Prescription: The Amazing Power of Honey as Medicine.” This book, written by Nathaniel Altman, explores the use of Manuka and other types of honey as an alternative to traditional medicines. 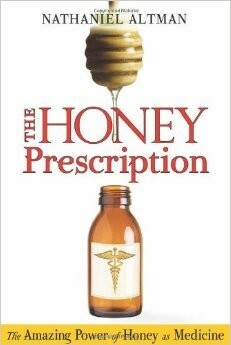 In this book, Altman explores the many different ways in which honey can be used for medicinal purposes and how these remedies can be used by medical professionals as well as safely in the home. The book also includes a large selection of honey based recipes that can be used for a variety of different purposes including conjunctivitis, burns, ulcers, tooth decay, and much more. Altman also dives into the psychological reasons for why honey is so effective in treating antibiotic resistant diseases. “For millennia the honeybee has kept humans healthy by pollinating so many of our fruits and vegetables and by providing two of nature’s most sacred healing substances: honey and propolis. After decades of ignorance, doctors are rediscovering the power of these miracle medicines, and Nathaniel Altman is here to spread the good news. The Honey Prescription will amaze you, delight you, and, most important, give you a fantastic new ally to promote natural wellness,” wrote Rowan Jacobsen, the author of Fruitless Fall: The Collapse of the Honey Bee and the Coming Agricultural. Overall, Altman’s “The Honey Prescription: The Amazing Power of Honey as Medicine” explores the many uses of Manuka and other types of honey that many native people have known and used for thousands of years that are just now being explored by modern scientists and health professionals. As the Manuka honey craze continues, more and more books like this are likely to hit bookstore shelves and accompany the products they endorse in retail stores across the county and the world.